NTA UGC NET is a national level exam which will be conducted by the National Testing Agency in June 2019 onwards. By qualifying this test, postgraduate students can apply for lecturership in reputed universities and may also seek admissions for Ph.D. Programs in Net Coordinating Universities. The candidates who wish to appear in UGC NET must have fulfilled eligibility criteria declared by NET Coordinating Institutes. Below in this blog, you will be benefited with the NTA UGC NET Exam Pattern explained in detail. Please scroll down for complete information. Take your UGC NET preparation to the next level with the free study stuff available on Eduncle. Grab it Now! UGC NET Exam consists of two objective type papers. Each paper has its different standard and difficulty level which increases from first to second round. This round is General Aptitude Test which consists of sections like– Reasoning Ability, Comprehension Reading, Mental Ability, and General Awareness etc. To know more about the UGC NET Syllabus of Paper-I please click the URL. There will be 50 questions each of two marks. As per the UGC NET Exam Pattern 2019 Exam, the candidates must attempt all the 50 questions. The UGC NET Question Papers of Paper 2 (Opted Subject by Student) will consist of 100 compulsory MCQ (Multiple choices with a single correct answer), each of two marks. You may also check Experts' Suggestions to Nail the Exam with Top Scores. Please Read UGC NET Preparation Tips. Note - Paper-II covers the entire syllabus of the subject selected by the candidate. Both the Papers will be conducted in Computer Based Test mode in a single three hour duration. Note - Eligible candidates can download their UGC NET Admit Card using application no. and password or DOB from 15th May 2019. The Centre Superintendent will identify the scribe, only in case, a request is received from the candidates. He/she would be allowed to meet the scribe a day before the examination to verify the suitability of the scribe. There will be extra time of twenty minutes for Paper I and 40 minutes for Paper II for candidates having more than 40% disability irrespective of the fact that the aspirant is availing the facility of scribe. If a candidate suffering from diabetes, he/she allowed to carry into the examination hall the eatables like sugar tablets/fruits and transparent water bottle. Check Out UGC NET Answer Key 2018 to Know About Your Performance in the December 2018 Exam. Follow the Link to Download FREE PDFs. General Category Candidates – Candidates must secure 40% aggregate marks in both the Papers. Reserved Category Candidates – Candidates must secure 35% aggregate marks in both the Papers. Amongst those candidates who have cleared step I, a merit list will be prepared subject-wise and category-wise using the aggregate marks of both papers secured by such candidates. Top 6% candidates (for each subject and category), from the merit list mentioned under step II, will be declared NET qualified for eligibility for Assistant Professor only. A separate merit list for the award of JRF will be prepared from amongst the NET qualified candidates figuring in the merit list prepared under step III. Get Top Scores in UGC NET June 2019. Download Experts Designed UGC NET Study Material for FREE. Once you have cleared UGC NET Exam, you will be eligible to apply for the post of Lecturership as per the vacancies announced by the UGC Approved Universities and colleges. The selection will depend on your interview. The candidates who have interest in research program may also pursue Junior Research Fellowship from the Coordinating Institutes of NET. The selection procedure of students for award of JRF will depend on the student’s performance in the test. However, the candidates qualifying Assistant Professor exclusively will not be considered for the award of JRF (i.e., if you didn't opt for JRF while filling the form you will not be considered for the Fellowship program). Solve Last 5 Exam Question Papers to Practice Well for Upcoming UGC NET June 2019 Exam. Download FREE PDFs. Aspirants! We hope that the above information will help you in understanding the paper format in a better way. Also, share this blog with others so that they can also be benefited with this useful information. After all - "Knowledge increases by sharing not by saving!" 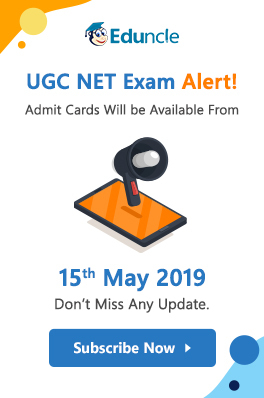 For more latest UGC NET updates or keep visiting the following blog - UGC NET Notifications 2019. If you have any doubts regarding UGC NET Exam, then do ask us in the comments box below. Sir i have done my MBA wid the Specialisation HR.... What subject should i choose for net 2018 exam? sir i have completed my b.tech in 2013. Now i have decided to take admission in m.sc computer science in 2017-2019. can i apply for UGC NET 2018? Hello, I have completed B. E in Electrical and electronics in the year 2017. So am I eligible to attend the NET EXAM? hello sir, please send me UGC net syllabus of commerce as per new pattern/syllabus with detailed information of both paper I and II. Greetings to the entire Eduncle Team. Sir, I want to appear NET for the session of January,2018. However, I will just be passing my 3rd semester of M.a in Political Science. Am I qualified to sit for the exams. Hello sir, Is there negative scheme of marking in thw exam? If yes, what %gae would be deduct as negative? sir i have completed MBA (Finance & HR). What all subjects can i choose for paper III or there are some specific subjects only. For eg. Being a MBA can i choose Commerce or it is compulsory to go with Management ? Sir I've done my m.sc with zoology, so apart from appearing in csir ugc net in life sciences, can I even appear in the cbse ugc net environmental sciences? Kindly revert sir.